In Microsoft Excel 2007, it isn’t difficult to use report and dashboard interchangeably. Often, reports are referred to as dashboards just because they included a few charts. Likewise, many dashboards have been called reports. All of this may seem like semantics but it’s helpful to clear the Excel air a bit and understand the core attributes of what are considered to be reports and dashboards. Reports are probably the most common application of business intelligence. A report can be described as a document that contains data used for reading or viewing. It can be as simple as a data table or as complex as a subtotaled view with interactive drilling, similar to Excel’s Subtotal functionality. The key attribute of a report is that it doesn’t lead a reader to a predefined conclusion. Although a report can include analysis, aggregations, and even charts, reports often allow for the end user to apply his own judgment and analysis to the data. To clarify this concept, Figure 1 shows an example of a report. This report shows the National Park overnight visitor statistics by period. Although this data can be useful, it’s clear this report isn’t steering the reader in any predefined judgment or analysis; it’s simply presenting the aggregated data. Figure 1: Reports present data for viewing but don’t lead readers to conclusions. Dashboards are typically graphical in nature, providing visualizations that help focus attention on key trends, comparisons, and exceptions. Dashboards often display only data that are relevant to the goal of the dashboard. Because dashboards are designed with a specific purpose or goal, they inherently contain predefined conclusions that relieve the end user from performing his own analysis. 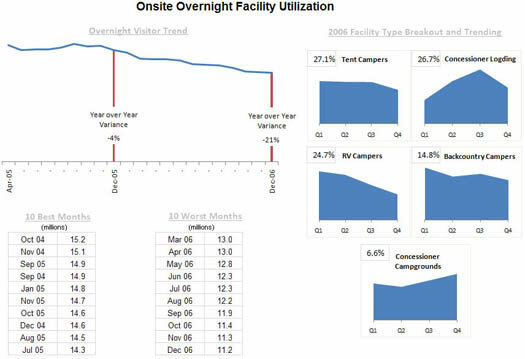 Figure 2 illustrates a dashboard that uses the same data shown in Figure 1. This dashboard displays key information about the National Park overnight visitor stats. As you can see, this presentation has all the main attributes that define a dashboard. First, it’s a visual display that allows you to quickly recognize the overall trending of the overnight visitor stats. Second, you can see that not all the detailed data is shown here; only the key pieces of information that’s relevant to support the goal of this dashboard. Finally, by virtue of its objective, this dashboard effectively presents you with analysis and conclusions about the trending of overnight visitors. Figure 2: Dashboards provide at-a-glance views into key measures relevant to a particular objective or business process.